For two years, Morgan from West Jordan, Utah, has stopped cutting his hair and letting it grow out so that he could have enough hair to donate to Wigs for Kids. Morgan’s brown hair goes all the way down to his back. 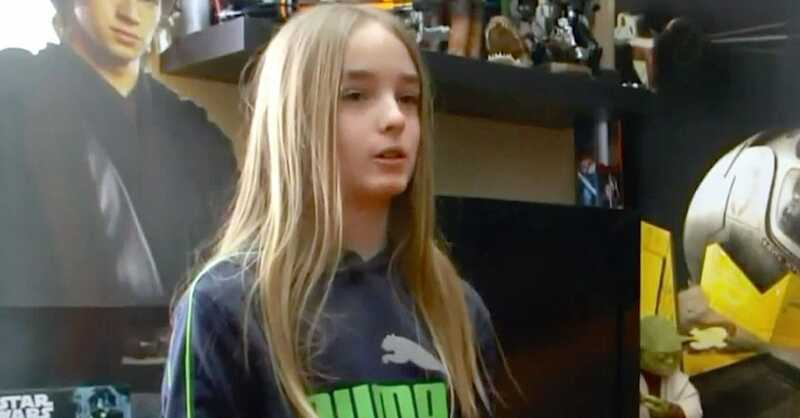 Over time, he has gotten a lot of comments, questions, and strange looks from not only his peers, but also parents who even assume he’s a girl due to his long hair. Morgan is a fan of Star Wars, just like many 12-year-old boys. He says that when he goes into the boy’s bathroom people can look at him funny and even adults will ask why he is in this bathroom. This isn’t the first time Morgan has started growing out his hair. He has done so already and immediately after he donated his hair, he went back to growing his hair out again for another donation. Despite any judgment, Morgan plans to continue the cycles of growing out his hair and donating. His mother, Sandrine, says that Morgan knows first hand what it’s like to overcome medical issues. He was born premature at only 27 weeks and spent the first few weeks of his life in the NICU. His mom said that he nearly died but he defied the doctor’s expectations and grew up to be a healthy and happy child. He now feels like he wants to do everything he can to help children feel as normal as possible, and that’s growing out his hair to make wigs. He’s now growing out his hair for a third time after getting it cut, and says that even when it’s annoying that people make comments, he’s excited about helping out other kids. Wigs for Kids is a cooperative effort with Certified Cosmetic Therapists throughout North American who share one goal. That goal is to not have children worried about the way they look, especially when going through a health crisis. The company wants the kids to have an opportunity to feel good about themselves. Wigs are valued at $1,800 and are custom-made hair replacements. Each wig is made from human hair and is hand tied, in order to make sure it looks like a child’s own hair. These wigs don’t come off on the playground or the field, so kids can look the way they did before any health problems and feel better. The founder of the company was a successful hairdresser and after his niece was diagnosed with leukemia, he did research in learning how to make children’s wigs. A kid’s wig is more difficult because kids are smaller and are more active. He worked with prosthetics specialists and doctors to develop options that would withstand kid activities, such as gymnastics and swimming, and if it gets wet it will still be like everyone else’s hair. In order to donate hair to Wigs for Kids, hair needs to be 12 inches or longer. While the minimum donation is 12 inches, it’s encouraged to donate more than 14 inches. The more you can donate, the more of an impact it will have. Once your hair is long enough, you will need to get in contact with a hair professional. The company relies on hair professionals that know how to property cut ponytails and braids for hair that will be donated to Wigs for Kids. Certain steps must be followed in order to make sure your donation is accepted. Once you have your hair ready, you send in your donation. For parents of children who need wigs due to radiation, chemotherapy, alopecia, or another medical reason, you can apply online. The Massachusetts Society for the Prevention of Cruelty to Animals (MSPCA) received an amazing gift with a new arrival at their shelter. 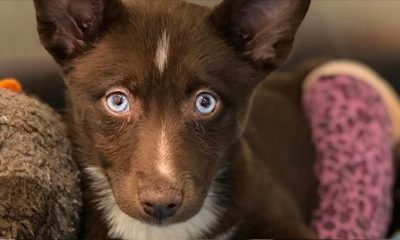 The long lines of people wanting Tahani, the mix of Siberian husky and Pomeranian, were quite a show at the shelter with news reporters arriving in a nice way to honor the miracle gift. Tahani even received gifts of dog bones, toys, and blankets. The shelter had miraculous adoption rates throughout this fun event and directors were pleased to see so many dogs getting adopted by such nice people. 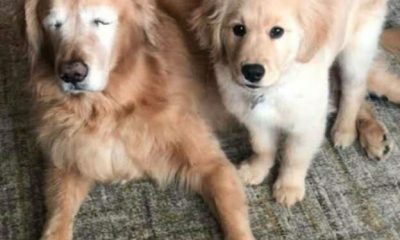 The impressive blue eyes of the rare puppy were seen by so many and enjoyed so much by the children that were able to visit calmly with the doggie. The shelter even received additional support with interest from the news stations, potential funders, and people calling about the shelter’s hours. Adoption rates made everyone happy and many discussed more events to celebrate the dogs and puppies waiting for the nice people to take them home. All were thankful the dog brought good news and so much happiness for the people that showed up to see her. The rare puppy was determined to be a “Pomsky”, which is a really rare mix and loved for the Siberian blue eyes. At 10-weeks old, the owners weren’t sure what to do with the little broken leg so they took the puppy to the shelter. The gift hit the news quickly and all were honored to be a part of such fun as people quickly lined up to see Tahani. The shelter enjoyed the opportunity to hand out information about dog care and adoptions. The young people were pleased to see how much nicer dog shelters are now and many signed up for workshops. The dog trainers that showed up were happy to discuss services and programs for animal care. The proponents of dog shelters are strong to present positive messages about dog care and adoption opportunities. The kids that showed up asked if they could see more happy doggies. Happily, several group leaders started discussing the opportunity with strong support for the suggestion. All applauded when some of the adults agreed to arrange dog shows. Anyone could bring their dog and many could work with them for the events. They were pleased to understand how simple it would be to have agility courses for the people and their dogs. Other suggestions for outdoor bands and concerts turned into a huge celebration for the little Pomsky dog. The small and larger events that were being planned arrived at the top of the news stories and all were again thankful. Little Tahani looked the cutest and everyone agreed. The news station really enjoyed that all the people were happy with the community outreach and additional support. The dog shelter was so much better and the staff was thankful for the incredible number of volunteers that signed up. The media that had showed up were enjoying the people and gifts of food that some had brought. The people were thankful they could mingle with the others and everyone was pleased with how polite the groups were together. They kept thanking the little dog and agreeing she had brought so many miracles for everyone. The “feel good story” hit the streets quickly and so many agreed they liked to be so happy with positive news stories about everyone working together in nice ways. 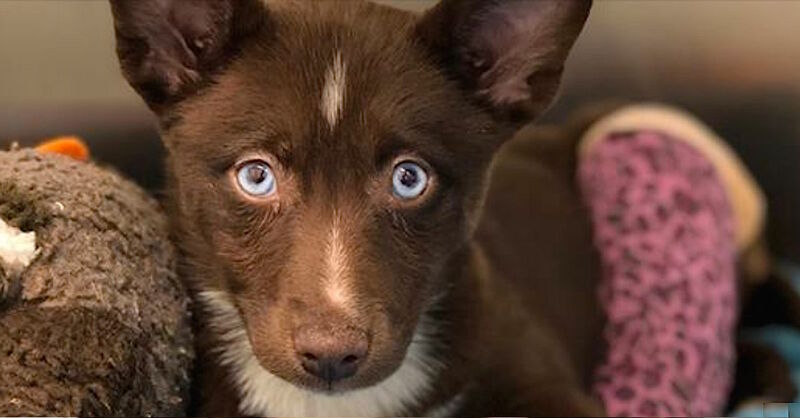 Volunteers continued to call the shelter and the amount of support funding had increased in an extraordinary way with little Tahani, the little blued eyed miracle puppy. 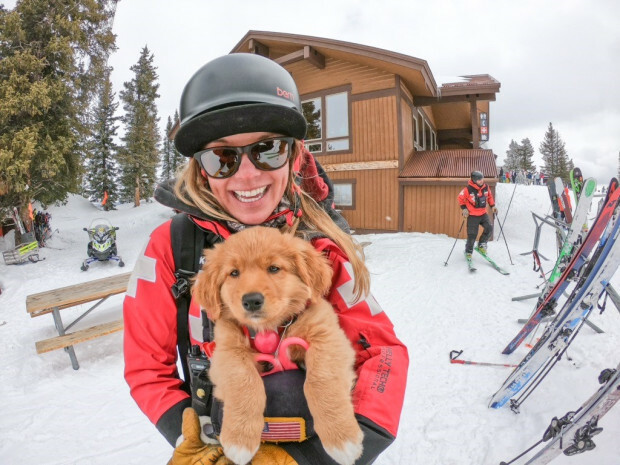 Vail Ski Resort has a new ski patrol trainee, a 9-week-old puppy named Cowgirl. Cowgirl is a Novia Scotia Duck Tolling Retriever born in Port Coquitland, B.C., a town near Vancouver. 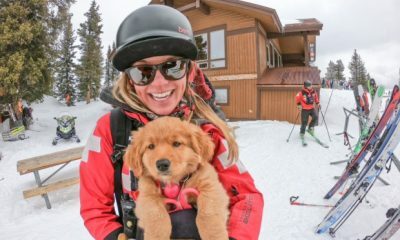 She and her handler Kori Landauer, will be training for the next two years to gain their Colorado Rapid Avalanche Deployment certificate and become the newest member to the ski patrol team. First though, she must get acquainted with one of the busiest ski mountains in America, and her four other canine co-workers. Hannah Dixon, a spokeswoman for Vail Ski Resort, told the Denver post that Cowgirl did well on her first day and her first goal is to become desensitized to all of the things on the mountain to include snowcats, chair lifts and the mass of people. Ski patrol dogs are needed on large mountains for avalanche rescues and for many other duties, like helping teach ski safety to guests and kids, assisting as therapy dogs for injured skiers, and more. With their speed, agility, and sense of smell, they are capable of locating buried avalanche victims. Luckily, avalanches within ski resort areas are rare. This is in part due to avalanche control measures that patrollers take part in, like firing explosives on risky slopes. Although avalanches are rare on ski resorts, ski patrol dogs continue their training and may even be called to help with off-site avalanche rescues by the county sheriffs. It is said, that one dog and its handler can do the job that 150 trained searchers can do in the same amount of time. Colorado’s Rapid Avalanche Deployment team aims for successful avalanche search and rescue. Cowgirl and Landauer will be trained for this and more to help save lives in case of an avalanche. According to the American Kennel Club, Cowgirl’s breed make good work dogs, so they are perfect for ski patrol. Novia Scotia Duck Tolling Retrievers are known for their intelligence, affection, are eager to please, and are hard-working. They also have a lot of energy and are strong, athletic, and agile. Landauer grew up in Vail Valley and has worked as a patroller at Vail Ski Resort for the last six seasons. To become a handler, she has be training and working with the other patrol dogs, who have welcomed Cowgirl with open paws to their team. If you’re wondering where the name Cowgirl came from, Landauer always wanted to be a cowgirl. She may not have lived up to that dream, but she now has a cowgirl in her life, in the form of her newest friend and puppy. There is a saying down south that goes, “Don’t mess with momma!” A mother will do anything they can to protect their offspring. It does not matter if it is a “David and Goliath” situation. Leopards are one of the quickest creatures on the planet. A hungry leopard cornered a family of Egyptian Geese, and the mother goose saved her babies with intelligence. In South Africa, at the Sabi Sands Game Reserve, a male leopard was captured on video how he planned to have geese for dinner. The leopard was quickly outsmarted by the mother goose who separated herself from the flock and her young. 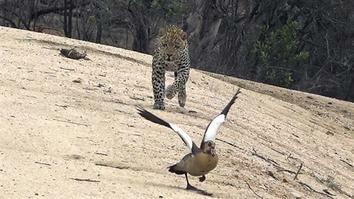 She faked a wing injury and caught the attention of the leopard, forcing him to chase her instead of the others. The mother knew this was the only way to save her babies which was too young to run or fly away. This heroic act drew the leopard away so the other geese could take the babies to safety. If an animal senses its prey is injured, it will be its choice of the kill. This mother goose timed it perfectly and was in the perfect environment. Leopards can only hold their speed and stamina for a short time. The mother goose kept the leopard chasing her through a water hole which wore out the leopard. When the mother goose saw the leopard was exhausted, she continued to fake the injury upon getting out of the water with the leopard on her tail. When the mother goose had the leopard far away from doing any harm to the flock and her babies, the tired leopard gave up the chase. The mother goose made her way back to the flock and mother and babies were reunited safe and sound. There are different types of geese, but they all keep the same loyalty to their flock. For example, if one goose gets hurt or sick and falls out of formation, then a few geese will stay with the sick or injured for protection. They will not leave the goose until it dies or flies. The geese will remain with each other when they take off again. They may fly with another flock until they catch up to their own. Geese are territorial creatures and can get vicious when people walk by their family or their babies. If they have a nest and someone walks by, rest assure, they will attack. Geese will not attack a predator. In the case of this leopard or another large predator, they use their intelligence to ward them off. It can be amazing to watch nature and how intelligent some animals are. Here we learn of the heart of a mother and the loyalty of a flock of geese. We learned how instinct takes over fear, and this mother goose becomes the ultimate hero. The flock pulled together, and they all waddled away happy. The ultimate lesson is, in nature, it is the survival of the fittest, but it is also the survival of the smartest. These Police Officers Are Mixing It Up With The Local Kids….Find Out How! For those of us who have gotten sick and tired of always reading headlines about the mistakes that police officers make on the job, this story is going to serve as a breath of fresh air. 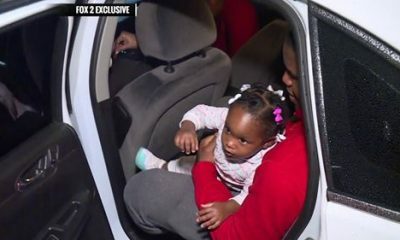 In a world where it feels like we are constantly inundated with bad news about our nation’s police officers, it is good to see a story like this one. Children who reside in Duvall, Washington were recently given quite the special treat. They were at a local park and they had come together to play some football in the snow. When these officers arrived on the scene, the children were not happy. What child would be? We are sure that these kids probably assumed that the officers were on hand to mess up their game. We would have thought the same exact thing if we were in their position. However, these officers were not looking to put a stop to their good time. Their intentions were something else entirely. When the clip first begins, we see the cops pulling up the football field. We also see the cops exiting their vehicles, while clad in full riot gear. This is the part where we started to get skeptical. These kids are just trying to have a good time. Why are these cops rolling up on them as if they are in the midst of some horrific crime spree? The cops start to approach the children. It is clear to see that they are taking a more cautious approach. The kids also look like they are pretty nervous about the arrival of the police. 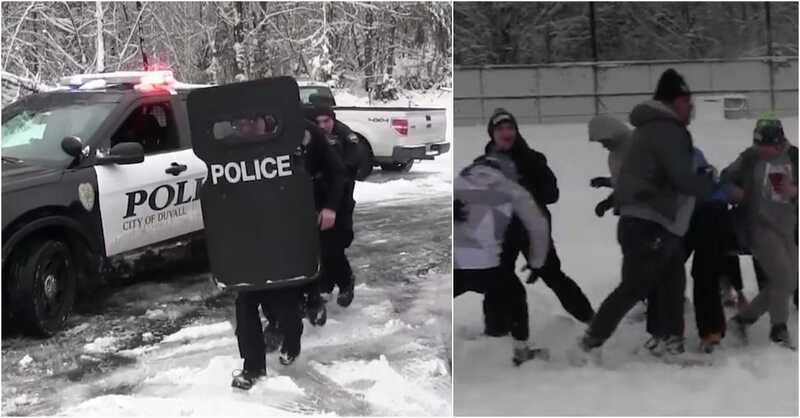 Can you imagine getting ready to play an innocent game of snow football and being greeted by a sizable percentage of the Duvall police force? We would probably take off running right then and there. The kids decided that they were going to let the officers know exactly what they thought of this intrusion. The football game was called off and the kids began to make a pile of snowballs. By the time the cops start to speak to the children, their fears are assuaged. This is not a form of harassment. These cops are simply here to have fun. They crack a few jokes about taking the kids downtown but it is all in good fun. Once they “advance” on the kids, they begin to pelt the officers with snowballs. It is a good thing that they have all this riot gear, huh? They are going to stay protected from the barrage of snowballs and teach the kids a valuable lesson in the process. It is not about who has the most snowballs to throw. It is about who has the most protection from said snowballs. There is something to be said for teaching the youth the most valuable lessons that they will need going forward. Now, these kids will probably take the time to build some shields, in addition to a mountain of snowballs. We got a major kick out of the one officer who hid behind all of the others and lobbed snowballs over the top of the rest of the group. He’s got the best idea of all. He gets all of the advantages associated with the riot shields and still gets to throw snowballs at these kids. That’s a man who has life all figured out. If you would like to check out this hilarious clip for yourself, please be sure to take a closer look at the link below. We are glad that this police visit ended in the way that it did. It was definitely quite the scary sight at first! John didn’t want to live the rest of his life without a loving dog by his side. 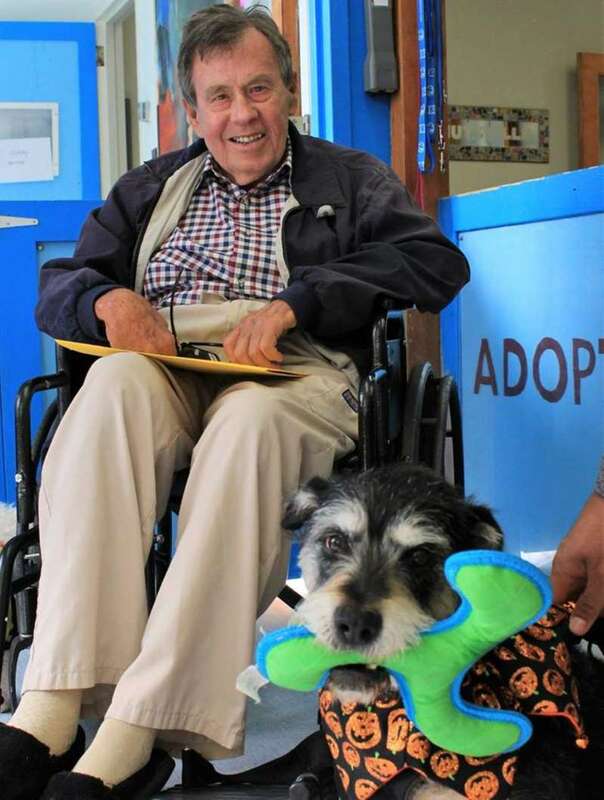 He needed a wheelchair to get around, but he knew that he was capable of finding a shelter dog and giving the dog a loving home. In 2017, at an animal rescue in California, he met his new best friend Pawpaw. Just like John, Pawpaw was considered a senior dog, so they instantly bonded and became a family. The last two years, Jon and Pawpaw have lived of life full of love. John grew up and always had dogs, and Pawpaw is John’s 13th dog he has lived with throughout his life. He has said that he couldn’t imagine a more perfect companion than Pawpaw. John suffers from ALS. ALS is a progressive neurodegenerative disease that can affect the spinal cord and the nerve cells in the brain. Unfortunately, there is no cure for the disease and the disease will eventually be fatal, since it will lead to the paralysis of the muscles that control breathing. As John’s condition worsens his heath has been declining and he is making plans for the future. His number one priority for the future is finding a home for Pawpaw so that the dog has a family after he passes away. 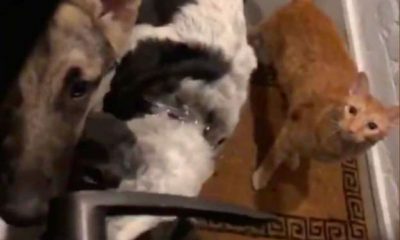 Many pets, even though they are beloved by their owners, end up homeless when their owners pass away, even if there are still other family members around. Other family members often don’t want to deal with the stress of an animal when dealing with other arrangements after a loved one’s death. John’s forward thinking is heartwarming, since he is trying to do everything in his power to make sure that Pawpaw won’t become homeless when he passes away. Many dogs will end up in local animal shelters, and for older dogs it can be deadly. Unfortunately, many animals have to be put down if there isn’t a home found fast enough. John is working with Muttville to find a new home for Pawpaw. Muttville gets a lot of different dogs from different backgrounds, but the founder of the shelter said that the ones that affect her most are the dogs that have a wonderful home but are brought there because their owner passed away or moved to a care facility and can’t take care of the animal anymore. Muttville has a program that is called Seniors for Seniors. The program helps seniors who have lost dogs and want a seasoned companion. Pawpaw may be a senior dog, but at 13 years old he still acts like a puppy. He is constantly smiling and loves every human and other dog he meets. Pawpaw is easygoing and will likely fit well into a number of different situations. He could be the right fit for a family or even a single person. He does like to enjoy an active lifestyle, but also loves the indoors and sleeping with his owner. Pawpaw can also go on to help another person who is suffering from an illness. There are many benefits to people like John having a dog. When John adopted Pawpaw, he was told he only had six months to live but he’s still here. Just like John, it’s not too early for pet owners to think about what will happen to their beloved pet when they pass. Animals are family and there should be instructions in writing and conversations with whomever will be your pet’s advocate. It can help save their lives. Many people are currently sharing John’s last wish for Pawpaw in hopes that he finds a new home soon.